February can be a grey and chilly month so we’re delighted to have a real treat in store with a fantastic night out at Babbacombe Theatre to give us all a good laugh and banish any winter blues. A fun night of comedy, music, slapstick and magic is coming to Babbacombe Theatre on Friday 21 February. The event is being held to raise money for us and we are extremely grateful and all really looking forward to it. The hosts and producers, of what promises to be a fantastic night of entertainment, are London-based comedy duo Revan and Fennell, aka Rosie and Alice. Not only did they win the coveted Funny Women Variety Award for 2013 they have also appeared at various London theatres as well as the Brighton and Edinburgh Fringe Festivals. Alice hails from the area and when she and Rosie heard about the work of the THHN they were determined to produce a fundraising variety night to help raise money. As well as Revan and Fennell themselves, the show will also feature extreme juggler and Britain’s Got Talent semi-finalist, Phil Blackmore, comedian and magician Stu Turner, slapstick male trio “Three Half Pints” and Tamar Broadbent, a multi-talented singer, composer and comedienne. Tickets are available to buy online at www.babbacombe-theatre.com or by calling 01803 328385. Tickets are £12.50 for adults, £11.50 for seniors, £10.50 for children or family tickets are available (2 adults and 2 children) for £40. This event would not be possible without amazing support from Babbacombe Theatre and sponsors for the evening, Babbacombe Model Village. We hope to see lots of you there. 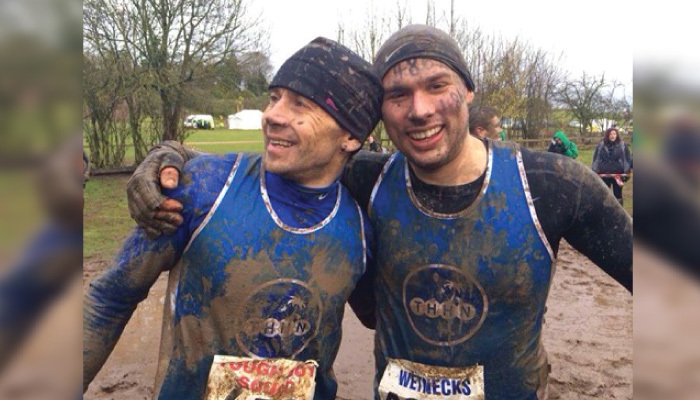 The Tough Guy event held in Wolverhampton in January is tough indeed. This is the obstacle course to end all obstacle courses. It’s 15km long with over 200 obstacles to contend with. Sounds exhausting doesn’t it? Throw into the mix some pretty bleak January weather and a LOT of water and you have to ask yourself, who would want to do that? Well, fortunately for us a team of particularly tough guys did. They went, they saw, they conquered, all to fly the flag and raise money for us. Thanks guys – rather you than us! Torbay Golf Club who have made the THHN their charity of the year for 2014 which is excellent news. Sarah Fairlie and her group of students who delivered a great load of beautifully wrapped gifts for families staying in our Memory Maker Caravan – what a lovely gesture. Torbay and District Funeral Service who donated £150 from their Christmas fund. We have a dedicated Events section on our Facebook Page and always feature upcoming THHN fundraising events each month in this newsletter. If you’re planning a fundraising event please make sure we know about it as we’d love to help spread the word. E-mail details to us at fundraising@thhn.co.uk Thanks!